I came across a news article put out by the BBC. It was entitled Earthworm Invasion: Aliens Causing More Harm Than Good? by Jeremy Coles and Matt Walker. It is an interesting article, and an interesting soil science topic. I recommend going and reading that article first, then come on back to ColbyDigsSoil to read the rest of this article. Earthworms are organisms that live in the soil. They consume soil that is high in organic matter (organic matter is basically decayed plant material such as fallen leaves, grass clippings, dead roots, etc.). As the worms consume the soil, their digestive systems break down the soil organic matter and converts it into energy for the worm. The worm excrement, called “castings”, is usually also high in organic matter, and it has an excellent soil structure that is similar to granular structure. The food that we humans consume is different, nutrient and composition-wise, than the waste we create. Likewise, the worm food (soil) is different than the waste they create. This is where worms can become useful, or become a problem. If they change the nutrient dynamics (how nutrients like nitrogen cycle through the environment) too drastically, it could cause problems, or even change the ecosystem all together. Changes caused by the invasion of a non-native worm species could include altering the amount of leaf litter on the forest floor, the out-competing of native worms by the invasive worms, increasing or decreasing the availability of nutrients to plants and microbes, and even altering the physical properties of soils like how fast water can move through the soil (generally, the faster, the better). All-in-all, it’s an interesting ecological problem. 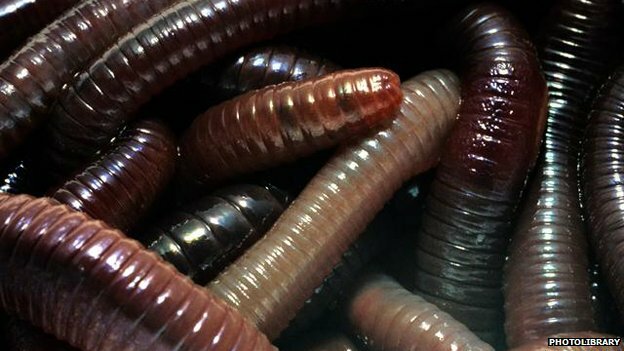 What are your thoughts on “alien worms”? Do you have any worm stories you’d like to share? Please do so in the comments section of this blog post. This entry was posted in Found on the Internet, In The News, Popular Culture and tagged earthworms, organic matter, soil, worms. Bookmark the permalink.